CNC designed and manufactured in house as a direct replacement for the standard top triple clamp. Facilitates mounting holes for securing the ignition switch holder assy TYLY-0041 for use on NSR conversion or TYLY-0042 for NC35 conversion. 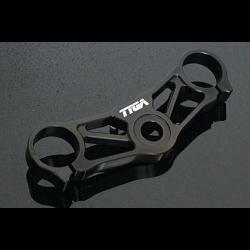 Crafted from aircraft spec 6061-T6 aluminium, using high technology 3D machining, the TYGA clamp offer high strength while being lighter than the standard component, and offers an improved and individual look to your bike.